Wisconsin welcomes us into the USA! 10-Sep-2016 Vaughn Hall provides brilliant setting for only US exhibition of Diaspora Tapestry on this tour! 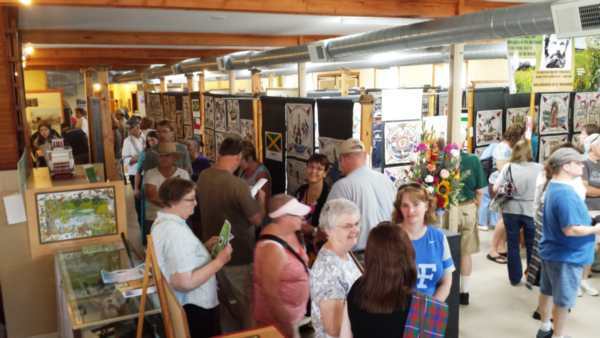 The Scottish Diaspora Tapestry exhibition at Vaughn Hall is hosted by the Wisconsin Friends of John Muir and the Montello Historic Preservation Society. 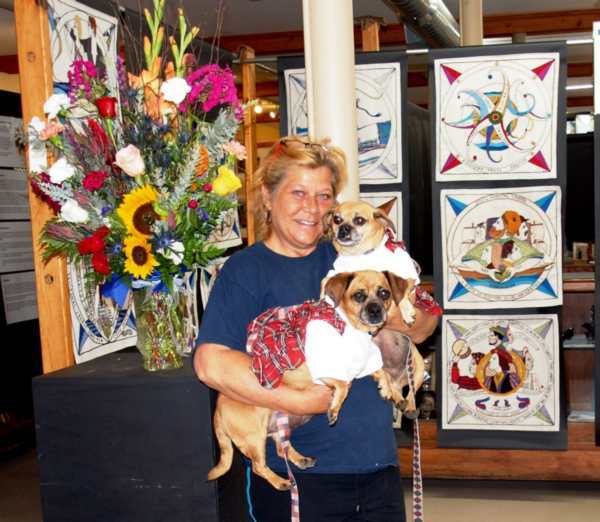 It opened on Saturday, July 16 with well over 250 visitors viewing the 304 hand stitched tapestry panels. The visitors crowded the historic blacksmith shop now turned museum after hearing bagpipes and being welcomed by local organizers as well as Sharon Beck [seen below right with the Piper] from the Prestoungrange Arts Festival who travelled to Montello from Scotland. 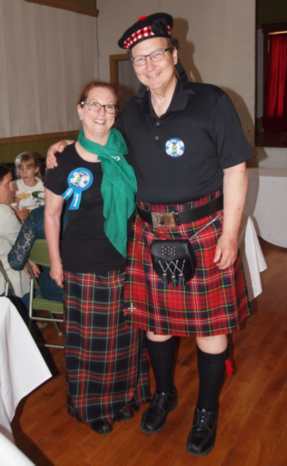 Judge Ben Bult and wife Lynn, owner of Peppercorn Catering, [pictured below left] were finely attired at the Tapestry on Saturday during the Scottish Fest. 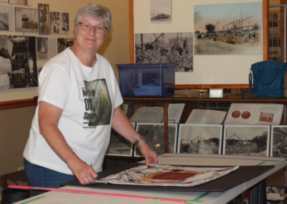 Lynn was the creative energy behind organizing the day-long events to celebrate the opening of the Tapestry exhibit in Vaughn Hall in Montello. Annette St. Onge, owner of Your Town Florist delivered a bouquet of flowers to Vaughn Hall on Saturday in honour of the Opening. 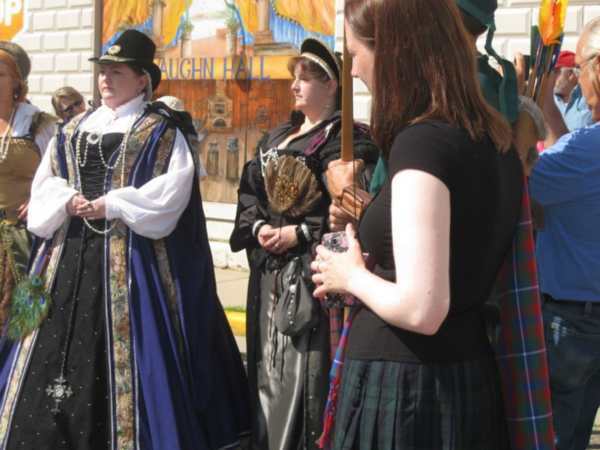 A day-long Scottish Fest to celebrate the opening of the exhibition which runs through July 31, included tea with Mary, Queen of Scots and two of her Ladies in Waiting. 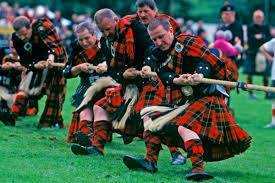 And there was a tug-of-war and other games at a local business where Scottish Ale whet the whistles of competitors and those who cheered them on. 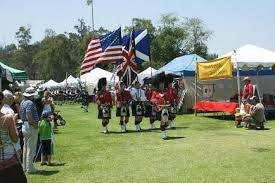 There was also a sheep herding demonstration, Scottish Clan tents, weapons displays, demonstration of an antique Scottish sewing machine and spinning wool, as well as children’s games and other Scottish-themed fun. A steady stream of visitors to the Tapestry exhibition continued the following days with many downloading the mobile App to better learn about the stories behind the spectacular works of art. 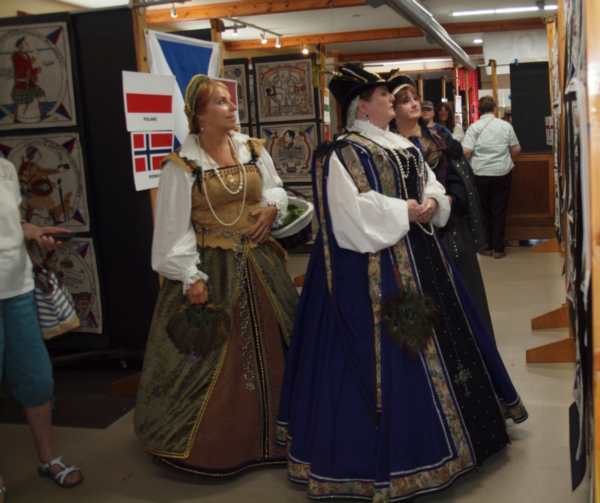 Mary Queen of Scots was in Montello with two of her Ladies in Waiting for the Scottish Fest. They held court and shared tea upstairs in the Garry Glover Community Room of Vaughn Hall in Montello. She met Betty and Blanche dressed in their best Scottish plaids for the day. 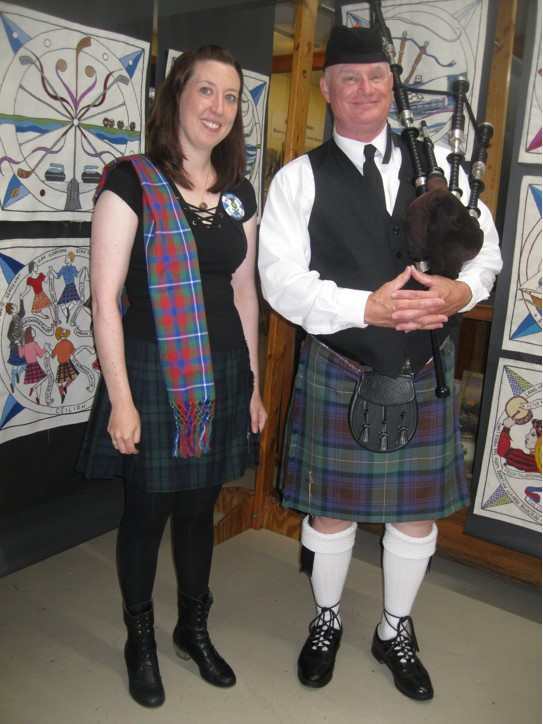 Volunteer Nikki Russos Harris [below right] was instrumental in helping organise the hanging of the 304 hand stitched tapestry panels that make up the Scottish Diaspora Tapestry on exhibition in Vaughn Hall through to July 31. It took volunteers several days to mount the panels. Sharon was hosted by Karen and Doug Weiss and Karen and Fred Wollenburg during her stay in Marquette County. 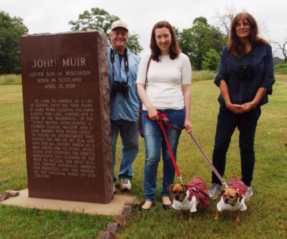 With Sharon, [centre left below] and Karen Weiss, right, is Daryl Christensen who helped the Scottish visitor learn about Marquette County as did Betty and Blanche.